Hurco created this website based on input from customers, application engineers, and sales representatives, who wanted all of the expertise regarding 5-axis and 5-sided machining in one place. We have dedicated an entire team to answer your 5-axis / 5-sided machining questions. When someone uses the term “5-axis” they are typically referring to the ability of a CNC machine to move a part or a tool on five different axes at the same time. 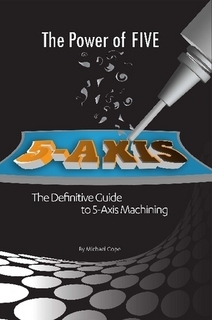 3-axis machining centers move a part in two directions (X and Y), and the tool moves up and down (Z). 5-Axis machining centers can rotate on two additional rotary axes (A and B) which help the cutting tool approach the part from all directions. We save 40 minutes per piece in cycle time alone and easily save an hour and 10 minutes total. Watch the “Insider secret to easy multi-sided machining”. Watch why more and more job shops are switching to 5-Axis. Watch a short presentation about why you should consider switching to 5-Axis machining. Just Released. Get the book today. With a 5 axis machine you can reduce setup time and increase accuracy on each part. You are also expanding your shop capability for more work. Often, there seems to be confusion due to the term “5-axis” machining center. Shops think they don’t have 5-axis work. Every shop has work that would benefit from a 5-axis machine because a 5-axis machining center facilitates 5-sided machining. Click the button below to download a simple worksheet that helps you assess the ROI of 5-axis.